Focal nodular hyperplasia (FNH) is a benign tumorlike condition of the liver with no known potential for malignant transformation. 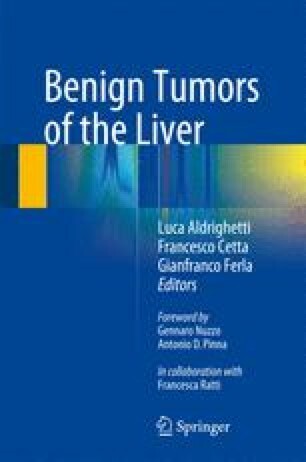 FNH accounts for approximately 8 % of all primary hepatic tumors and is the second most common benign liver tumor after hemangioma. FNH is in most of cases an asymptomatic incidental finding. The stability in size of most FNH lesions, the lack of potential for malignant transformation, and the extremely low risk of rupture and hemorrhage support a conservative approach for management of most patients with radiologically convincing or histologically proven FNH. When symptoms occur, in patients in with the diagnosis is not clear and if there is the evidence of progressive growth surgery should be considered.